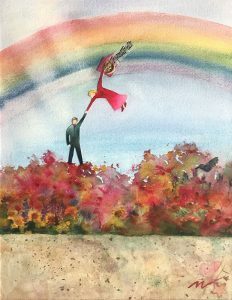 Tumalo Art Co. artists are exhibiting a group show, “Big Love”—art about what we love during the month of love, opening February 2 from 4-8pm during the First Friday Gallery walk. 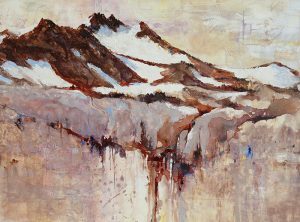 Featured are several large format landscapes by Marty Stewart, Janice Druian and Sarah B. Hansen, mixed media by Shelli Walters and abstracts capturing the color of love by Langford Barksdale. Judy Hoiness contributes two smaller pieces of her series of mixed media landscapes, along with Helen Brown’s memory in watercolor batik of a favorite family retreat. Bruce Jackson shows fine art photography, and Katherine Taylor’s shows an oil of roses, along with sculpture, hand-blown glass and more. Watercolor on plexi glass by Sarah B. Hansen of Mt. Jefferson in the Cascade Mountains. Mary Marquiss’s painting “Divinly Driven”, was inspired by Marc Chagall. “I first saw his work on the ceiling of the grand ballroom in the Opera National de Paris in my early 30’s and instantly admired his whimsical style and freedom of expression. It has been written that Chagall was able to brilliantly conjure up his childhood memories and retain his child-like, uninhibited fantasy and that he always looked at the world with astonished eyes–characteristic of many creative people. It has also been written that he carried a pure and simple heart – and that is what resonates with me the most,” says Mary. Tumalo Art Co. is an artist-run gallery in the heart of the Old Mill District, open seven days a week. www.tumaloartco.com, 541-385-9144.